Goodness, quilt pattern making is hard. I never realized just how hard until I started work on the Sailor Moon quilt. First off, trying to figure out how much fabric I needed for this quilt has been… an adventure, to say the least. 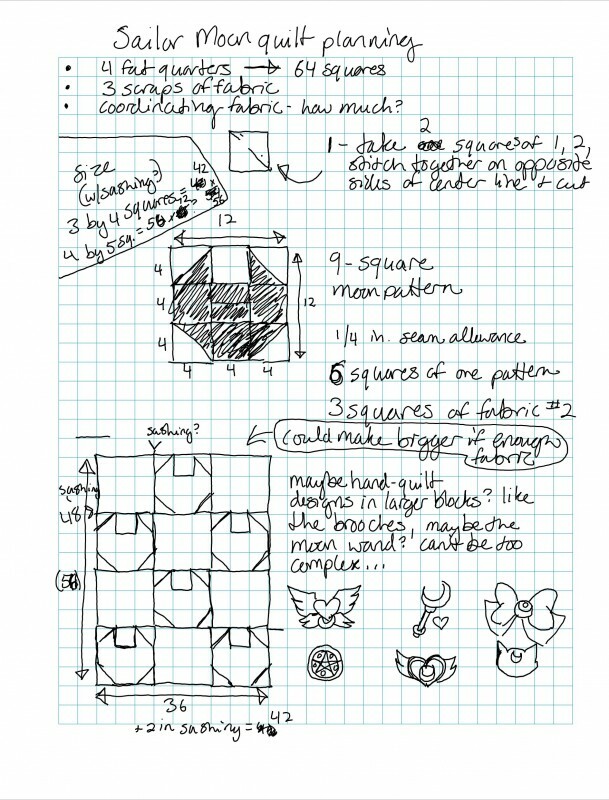 I started off with very uneven amounts of old Sailor Moon fabric, and thought to myself, “okay, I’ll try out making a pattern where the main squares have a moon pattern in them, and then alternate them with 9-block squares!” I roughed out a pattern based on 12-inch quilt squares, made up of 9 pieces, and figured I’d at least have enough Sailor Moon fabric to make that pattern work. It was a great idea, and I was super excited – however, I’d actually ordered the fabric I was going to use for the quilt before I actually built the pattern. Which was not the smartest idea I’ve ever had. 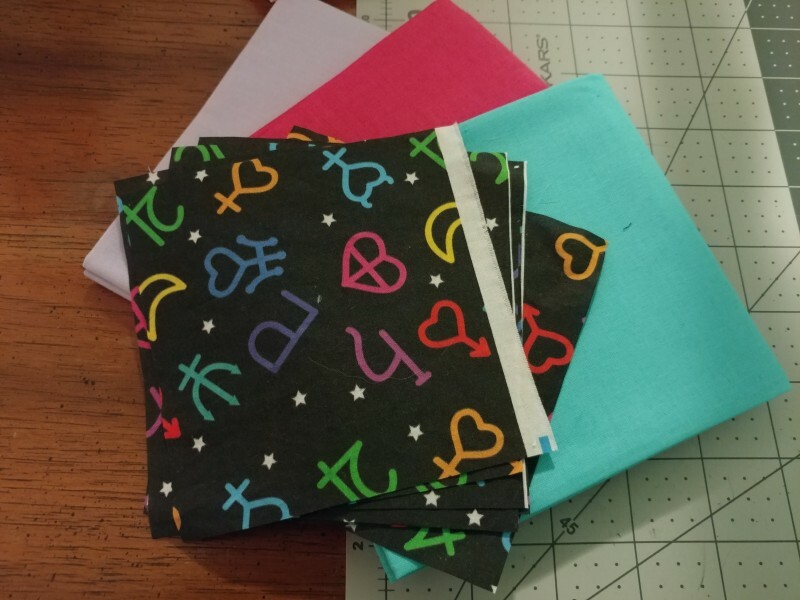 However, I cut my existing fabric into squares while I waited for the fat quarters I’d ordered from Spoonflower to come, and did some research to figure out how many 4.5 inch squares I could get out of a fat quarter. Turns out, you can theoretically get sixteen 4.5 inch squares from a fat quarter! If the fat quarter is appropriately sized, anyway. With the brooches and more complex designs, I’d suggest doing appliqué. I haven’t done much quilting, but it’s easier to layer things with that technique then try to get too complex with straight lines. I was thinking of just stitching the outlines of the brooches as the pattern for quilting all the layers together – although an applique quilt with those designs would be pretty darn awesome. Maybe someday I’ll tackle that, heh.